Twice H. Pieceman is done with humans, and he has been for a long time. On Earth, in life, he was surrounded by the death and suffering of the Vietnam War. After death, he was “reproduced” as an NPC within SE.RA.PH, but that NPC status meant the Holy Grail would always be out of reach, so he sought a successor who also felt the future was wrong. When none came, and humanity grew stagnant, Pieceman stopped seeing the point of letting it all continue. That’s pretty much where we’re at when Hakuno, Saber, Rin, and Leo arrive at the doorstep of Angelica Cage and the Moon Cell Core, still shielded and guarded by Chakravaratin, the Noble Phantasm of Pieceman’s no-longer-around Servant. Oh, and Pieceman is also a Dead Face; a remnant of his digital body that was destroyed when he sealed off SE.RA.PH. Killing a final boss that’s already dead will be impossible…but they don’t have to kill him; they simply need to get past him. 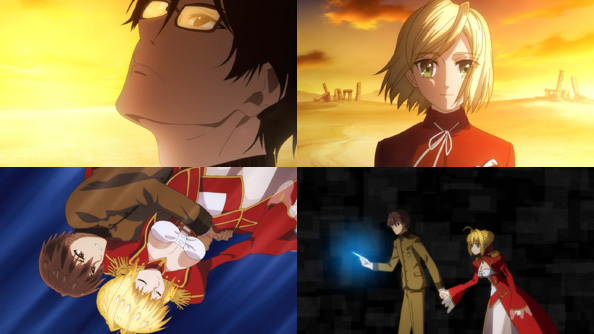 When a frontal assault on Twice and Chakravaratin by Rin and Saber fails (Leo is initially neutral and takes no action), Pieceman informs them even if they wish to save humanity, it’s too late; showing them images of what has become of Earth. Yet Hakuno is sure there are survivors he wasn’t able to eliminate—even after a millennium of trying—who will one day make their way to SE.RA.PH to continue civilization. Having heard both sides, Leo abandons his neutral position and uses a barrier to shield the others from Chakravaratin’s lasers. He also summons Gawain and uses his final Command Seal to order him to use Excalibur Galatine on the wheel, damaging it and giving the others time to finish what he’s started. 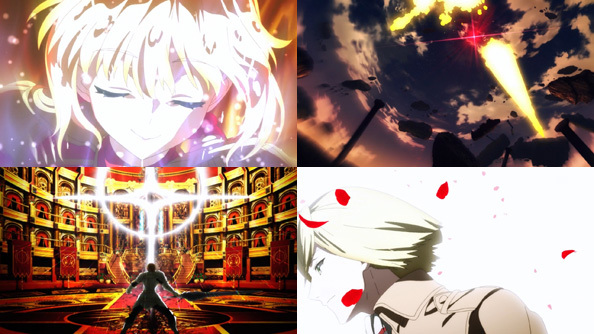 Leo goes out as a proud leader fighting for the future of humanity, and Gawain goes out with a majestic bang, reforming Excalibur with the light of the sun. Damaged but not stopped, it falls to Saber to fly up to the wheel and cease its turning so the shield over Moon Cell core will drop. Emperor Nero Claudius proceeds to prove her worth by achieving what is “no mean task”—stopping Chakravaratin as she promised. While she expected Hakuno to race to the Moon Cell core, he sends Rin instead, as the only true Holy Grail War Master still “in the game” (he’s not an official participant). That allows Hakuno to come to Nero’s side near her end, which was the one simple wish she told the female Hakuno, since dying alone the first time was “harsh.” She gives Hakuno her sword and sends him off to Moon Cell. 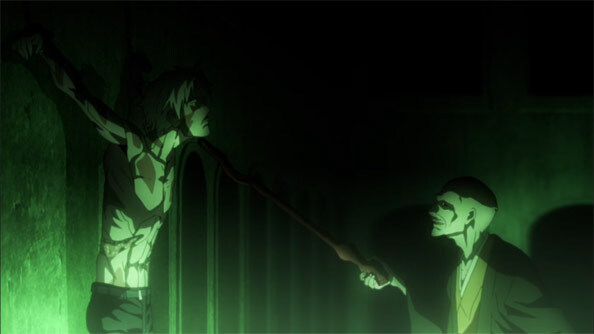 Believing he’ll be able to manipulate a fellow Dead Face’s body and use it as a vessel, Twice is surprised to find his attempts are utterly ineffective as Hakuno bull-rushes Moon Cell, passing right through Pieceman. Despite being a Dead Face, Hakuno was able to go against his kind’s nature by expressing no hatred and not considering Pieceman a foe. Hakuno shatters the shield and joins a somewhat flustered Rin right by the core. Touching returns Moon Cell to normal, but results in his disappearance. It’s something he does willingly, with a smile on his face: a being shrouded in death believing in life; and not shrinking from his duty, which led to his end, despite yearning for that life. Down below at the ruins of Chakravaratin, Nero offers her congratulations to her Master and disperses in a cloud of rose petals, and Moon Cell is restored to normal, whatever “normal” is. The only person who appears to remain there is Rin, sporting a new dirty-blonde hair color, looking ready, willing, and eager to welcome the survivors of Earth, that they may begin rebuilding civilization. And there you have it…FELE is at an end. Sure, at times things were a bit hard to follow and the jargon was a bit too dense for my tastes, but through it all Hakuno never ceased his dull optimism while Saber and Rin never ceased being awesome and fun to watch. Even Leo had a nice redemption here. The setting of the final battle was appropriately sprawling, with intricate structures sticking out in a vast, austere void. The soundtrack delivered at every turn, just as it had throughout the show’s run. 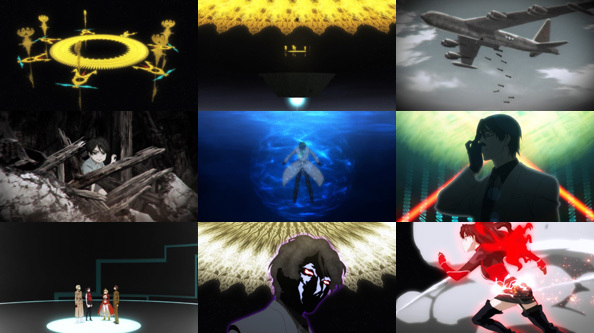 Shaft’s trademark closeups were on full display but not overused. It took a few months, but FELE came to a powerful and satisfying conclusion. 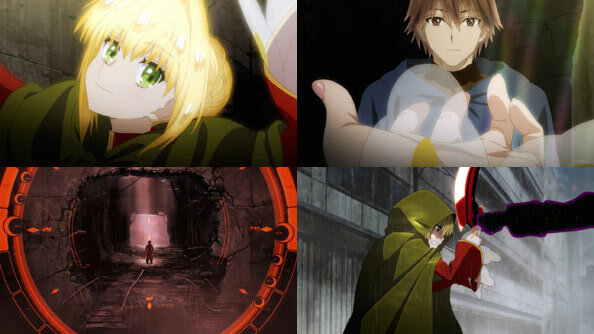 Shortly after Hakuno and Saber are expelled from the Seventh Level, Twice Pieceman paying Leo a visit from the Angelica Cage in an apparent flashback. Their unaligned positions are laid bare: Twice believes there is nothing left of humanity but its past; Leo still believes he can restore it if only he has the grail. As a Harwey, Leo has long been groomed to be the ultimate leader, but while he can “control” humanity, but he can no longer save them, or even live among them. Kishinami Hakuno may not even be a real human, but he still wants save them and continue to live as one. The previous act’s ending suggested he and Saber had a long climb ahead of him, but while FELE faithfully replicated the old-school video game cruelty of having to start back at the beginning, Hakuno had in his pocket the bookmark of hope Alice gave him, which serves as a handheld save point. Once he and Saber finish falling, he uses the bookmark like a phone flashlight to lead them through Limbo, where they first met. Rin gives a report; she’s still on the Seventh Floor just barely staying alive against Leo and Gawain as SE.RA.PH begins to crumble around them. Leo doesn’t have a concrete plan for defeating Leo, but a simple realigning of his thinking will serve him immensely in Round Two. 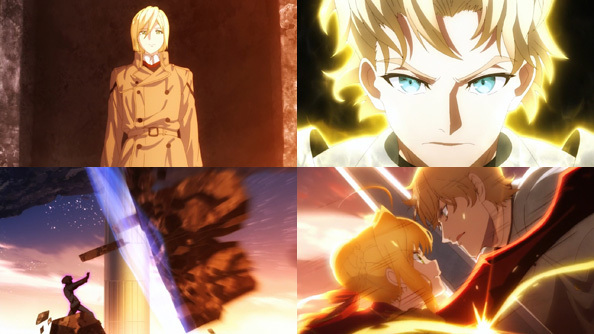 In Round One, he and Saber were separated, having to fight their counterparts one-on-one and being so overwhelmed they had no time to regroup. This time, they’ll arrive side-by-side and fight as one unit. Neither Hakuno nor Leo believe a mass of anger and hatred—much of it collected from those who failed to defeat Leo—will ever be sufficient. As such, when Hakuno and Saber arrive to spell an exhausted Rin, Leo is more bemused than anything else; the Dead Face has a death wish. But Hakuno doesn’t wish do die, nor is he not dying because he’s pursuing a concrete goal. He wants to keep living so he can find a goal. The warmth of Saber helps him to focus just the anger within him, not the hatred. She believes she can break Gawain’s Excalibur, and only needs Hakuno’s best for an instant to do so. It’s the ideology of hoping the best they can do will suffice against Leo’s bored arrogance and certitude. 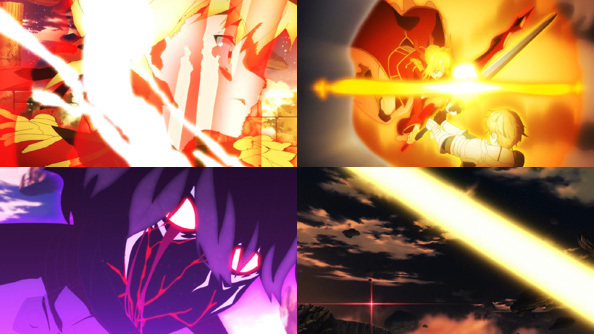 Indeed, Gawain and Excalibur put on a bigger, brighter show than the tiny red glowing dot that is the Dead Face-turbocharged Saber, while Hakuno’s face starts to crack and bleed like he could come apart at any moment. But again, a moment is all Saber needs, and it’s what she gets, smiling when the light comes, knowing she’s got it. She shatters Excalibur Galatine in two and then activates her Golden Theater for One Final Play, Fax Caelistis; the Closing Rose that Fames Stars. Excalibur is broken. Gawain is disarmed. Leo concedes defeat, and the battle is over without him dying, as is the rule of the Holy Grail War…though his still-smug look still amusingly pisses Rin off. 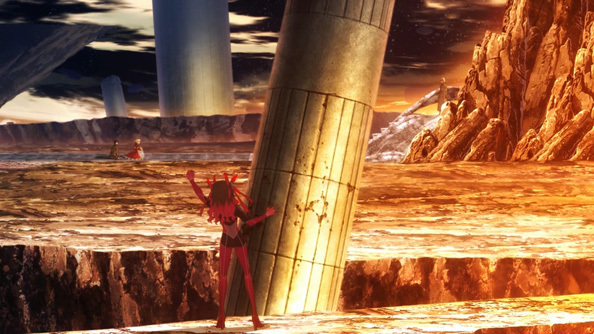 Leo rings the bell signalling Hakuno’s victory, and the floating chunk of rock upon which they stand begins to rise, taking them up to Angelica Cage AKA the Tree of Possibilities (without a bath, to Saber’s disappointment). Rin is upset that Leo still looks like he won something even though he just lost…but maybe he did win something by losing. Unlike Pieceman, Leo hasn’t given up on humanity, only he lacked the ability to save it. By conceding to someone who can, a part of his goal could yet be achieved. The best Hakuno could do was enough to get to Pieceman. Will it be enough to defeat him? And barring defeat or victory, can humanity be saved another way before SE.RA.PH perishes? When last we saw Hakuno and Saber, he had just saved Rin and Rani from an eternal stalemate (though only Rin survived); we now rejoin them as they ascent to the seventh and highest floor, where master Leonardo Bistario Harwey dwells. 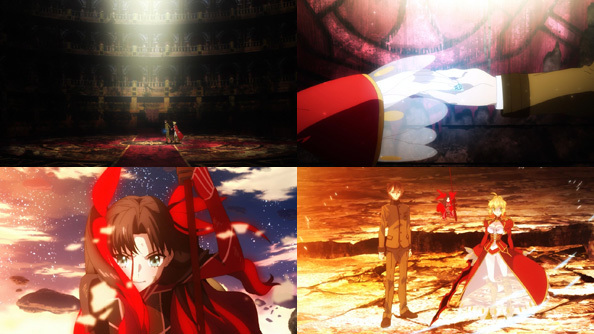 Even though Rin and the female Hakuno managed to defeat Leo and his servant a thousand years ago, it was only because Leo “gave up the win” of his own volition. 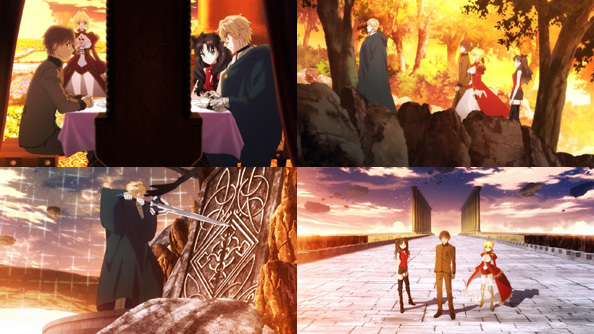 They arrive at a painfully gorgeous yet empty place, and are met by the Saber-class servant Gawain, who has neither the will or reason to raise his sword against them. Turns out Leo was saved by Twice Pieceman (the one who holds the grail and from which whom no servant has ever taken it) and subscribed to the ideology of Twice, maintaining the status quo on the floor. Since humans can only survive through change, he became humanity’s enemy. After about a century, he determined no challengers would come forth, and settled into a slumber, where he remains…until now. 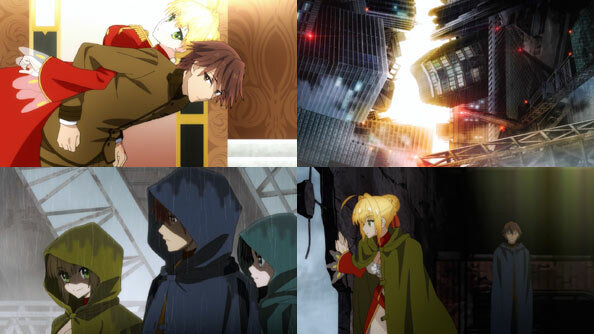 Gawain leads the new challengers to the place where Leo sleeps—though not before Saber pays respects to her former master, whose tomb is situated on a picturesque cliff overlooking a waterfall. As much as Saber liked that Hakuno, Rin opines that perhaps if Leo and not Hakuno had won and made it past the Seventh Floor, perhaps SE.RA.PH and humanity might not be in such a bind, because Leo wouldn’t have lost to Twice as Hakuno did. Even so, it’s likely civilization would have still fallen for other reasons related to the kind of person Leo is. Regardless, the present Hakuno must do what neither Leo (devoted to preserving the present) nor Twice (obsessed with the past) ever could: look to the future; the only way forward for mankind. To do so, he must do what his predecessor did and win against Leo…only this time when he awakens, Leo is prepared to fight back rather than conveniently resign. As soon as he’s up and about, Leo sics Gawain on Saber and starts attacking Hakuno, who can barely deflect his attacks with Dead Face. Saber is similarly overwhelmed by Gawain’s power, and notably neither are able to properly support one another or compensate for their shortcomings. It’s a relatively quick but still extremely epic and badass battle. 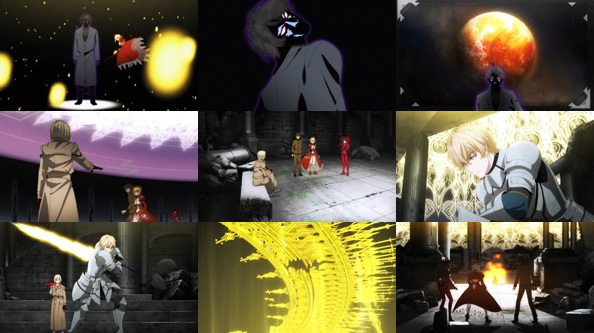 Leo orders a coup-de-grace in the form of Excalibur Galatine, Gawain’s Noble Phantasm that basically creates a facsimile of the sun itself to incinerate his opponent. While Saber and Hakuno survive the onslaught, the ground beneath them does not, and they fall, perhaps all the way back to the lowest level. Speaking of levels, it’s as if they approached a boss in an RPG without sufficiently leveling up, and simply got schooled. Unfortunately, there’s no time to gather more power; nor is there time to ascend all the way back to the Seventh Floor: Chakravartin will be complete in a matter of hours. 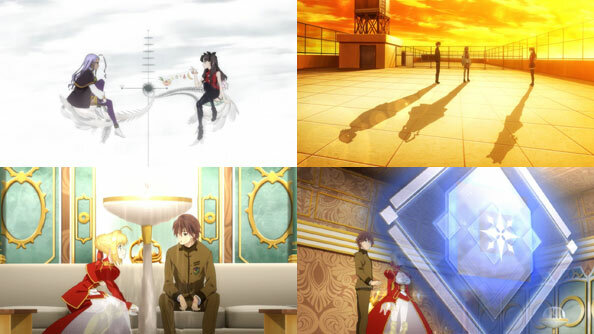 Just when Hakuno was his most resolved, he’s swatted down…and even if he manages to reset Moon Cell, it will most likely mean deleting the last thousand years of history. Since that history contains the defeats and amassed negativity that led to his creation, restoring Moon Cell will presumably claim Hakuno as well, meaning history could easily repeat itself with no more hero to correct it again. Still, I’m sure he, Saber, and Rin can figure something out. 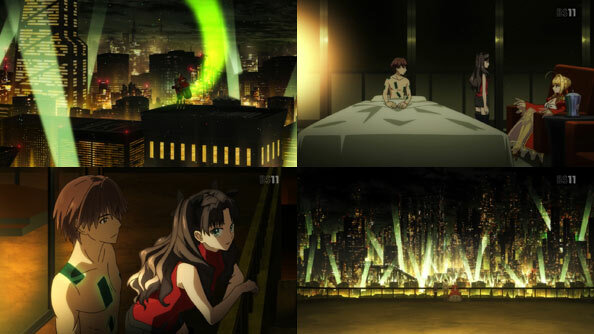 FELE’s last episode for a while elaborates on the plan devised by Rin and Rani to bring a Master to the Sixth Floor, and they relay those plans to Hakuno on the roof of a high school down on what I assume to be the level where he started. Waking up in the ladder with Saber, Hakuno explores his code casting powers, which apparently contain all of the weapons and skills of the masters who died before him. That combination of abilities adds credence to Saber’s insistence that he is himself and no one else, and must proceed as such. When they reach the Sixth floor, it is a white wasteland piled with long-unused lances. 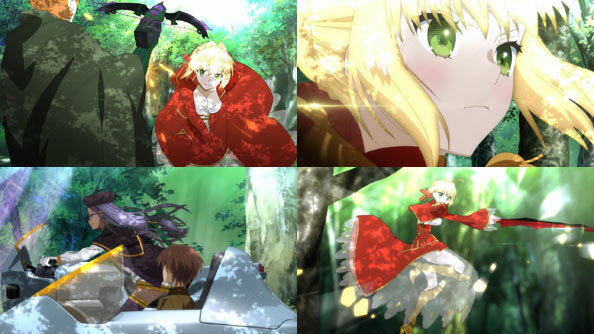 Suddenly, Rin appears in her Lancer garb and attacks Saber, and a giant Rani sneaks up on Hakuno. 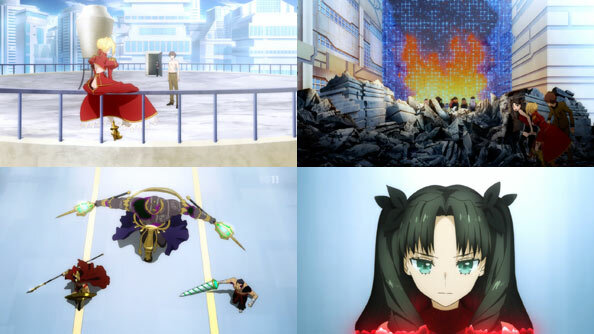 Then Rin and Rani fight each other, more Rins show up, more Ranis show up, and Hakuno and Saber basically get a very efficient course in what’s been happening for about a millennium. They realize the lands and waters are littered not just with weapons, but corpses of endless Rin and Rani copies. 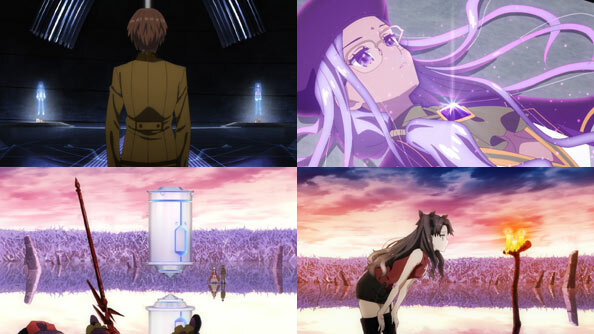 But there is one place where there are no corpses, and Hakuno determines that’s where they should go. While pondering what the heck is up with all the Rin copies, the “real” Rin arrives, but like her “soldier” versions, she’s only a digital copy, and a fragile one at that. She’s just able to lead them to the central dome when she starts to disperse, a process she tells them actually hurts quite a bit. Within the halls of the dome, recorded video of Rin and Rani is projected on cross-shaped supports. They once fought as rival Masters on this floor, but Moon Cell deemed their fight a draw just before the Holy Grail War was suspended, leaving them in a horrifying limbo of fighting and killing each others’ endless digital copies as the “originals” lay dormant. It’s a stalemate, but it’s also a bug in the system that’s gotten way out of control, so they both sent avatars of themselves to guide Hakuno here, so he could end the cycle and choose a winner and a loser, something Moon Cell couldn’t do. 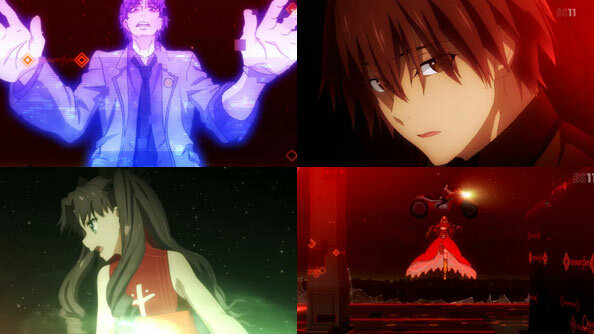 However, Hakuno doesn’t choose to kill either Rin or Rani. Instead, he tries to revive both of them. 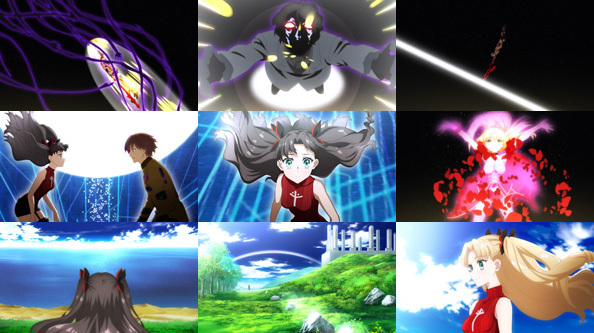 Only Rin survives, while Rani passes on due to the “peculiar” nature of her digital body. But she’s grateful for the attempt, and Rin is grateful he succeeded in bringing her back. Once Rani is laid to rest, she commits herself to continuing to aid Hakuno until the end. 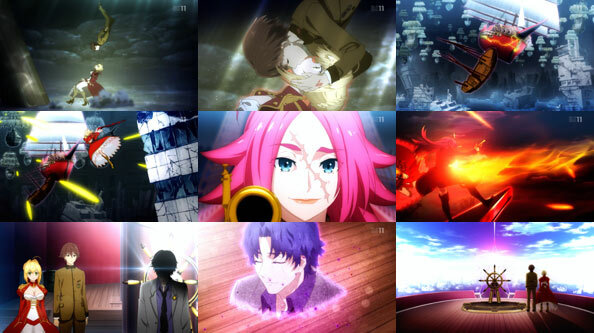 “Fate Spin-off By Shaft” was met with mixed and polarizing emotions, but I for one enjoyed it immensely. It took the parts of Fates I’d seen before and liked and placed them in a gorgeously-rendered distant and unsettling future where a tiny glimmer of hope still remains thanks to a walking talking manifestation of death itself and his trusty, adorable, formidable Roman Emperor of a Servant. I’m looking forward to Part Two. 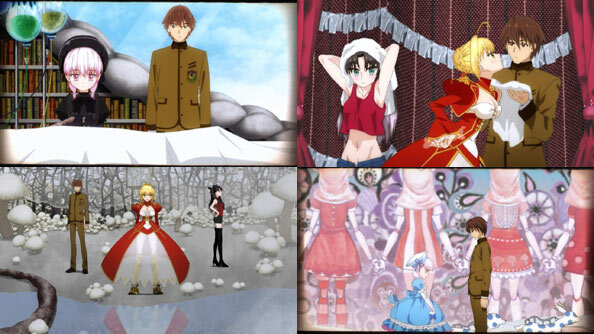 The “film” the female Kishinami Hakuno shows her male counterpart is of her own quest with Saber as her Servant, and a more noble, loyal and true servant, no one could possibly have. 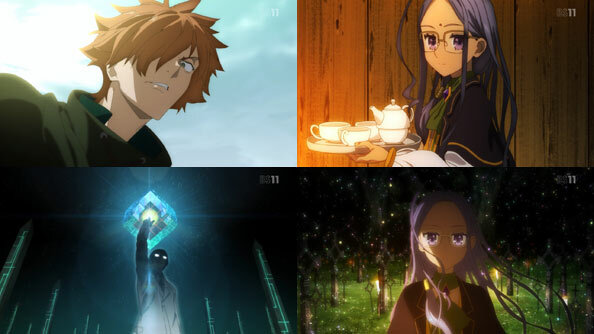 Like the current Hakuno, the female Hakuno learns that she’s neither wizard nor Master, but a “recreation of the data of someone who once existed”; an “NPC”. But Saber tells her that’s of no consequence, either to her value as an individual or her role as prospective victor of the Grail War. 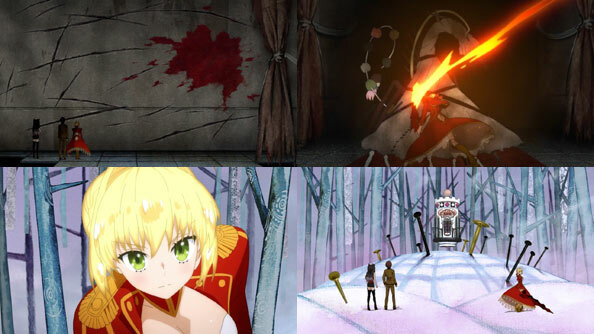 It is in She-Hakuno’s moment of deepest despair and crisis of identity that Saber reveals her True Name: Nero Claudius, fifth emperor of the Roman Empire and one history condemns as a raving despot and dictator. 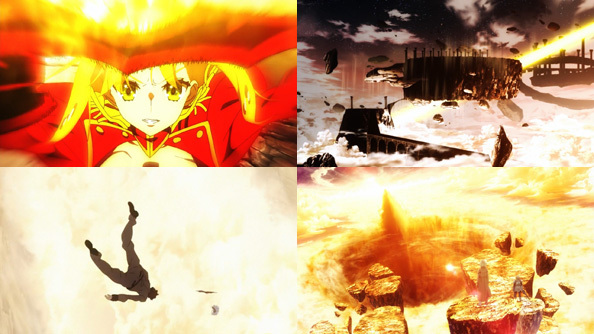 Naturally, Nero herself has a more nuanced life story to tell, and that story is told through what appears to be the work of Ueda Hajime, a frequent collaborator with Shinbo Akiyuki who also animated all Monogatari EDs. Saber makes no attempt to sugar-coat her tale or excuse the life she led, only to lay it all out to provide Hakuno with context in which to consider her sage advice. Nero loved strangers and commoners more than the royal family to which she belonged. She’s proud of bringing the Great Fire of Rome under control, but as her reign went on she became seen as a moody, unstable dictator. The Senate could not depose her as long as she had the loyalty of the common people, but when push came to shove no one came to her aid when she was brought down, and she died alone, in despair, with the love of no one. 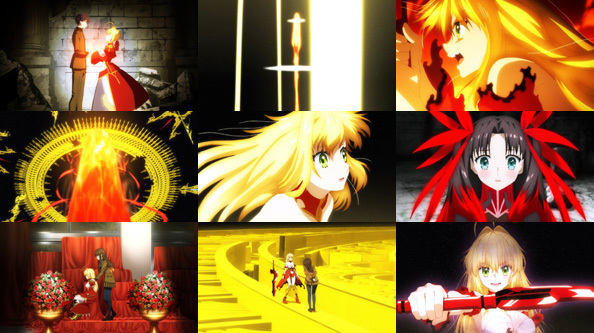 Both in its flamboyantly unconventional presentation, themes of adoration and fall from grace, and truly epic scope, Saber’s story parallels that of the vampire later known as Oshino Shinobu in Monogatari. And now that we finally have the whole picture of who Saber is, and was, we can appreciate just how much weight there is behind her words of encouragement, for both past and present Kishinami Hakunos. She is at peace with her demise, and will set her life ablaze for the sake of those who wish to believe she is beautiful. In other words, who will love her. Whatever love she had in her lifetime—of family or people—was either nonexistent or fleeting, so it stands to reason she’s not picky about where she gets her love now. Both Hakunos may deem themselves pale imitations unworthy of having a Servant as excellent and wise and kind as Saber. They are utterly mistaken for thinking that way. Saber doesn’t care from whom she gets her love. In fact, she would prefer if those people did not “mind every little thing” about themselves. Call it the extension of her affinity in life for those deemed “less than” in the society in which she lived. Commoners. Bastards, cripples, and broken things. And yes, even NPCs who have been killing and hating for a millenium. Saber’s been dead three millenia, but doesn’t let it get her down for a second. To her, Hakuno isn’t beholden to the person or people he was before. As far as she’s concerned, he’s is a new person, who deserves a fresh start without prejudice. But he has to take it. Reinvigorated and healed thanks to the ministrations of Rani (or, at least, her ghost), Hakuno and Saber head back out. Saber faces off against Berserker once more. After copying and countering his martial arts moves with Royal Privilege, she unleashes her Noble Phantasm: Kingdom of Heaven and Hell, the Golden Theater of the Deranged, and Veil of Petals, ending Berseker without any difficulty. It’s a short but gorgeous battle. That leaves Hakuno to deal with Julius, who no longer has any backup. Julius tries his usual spiel denigrating Hakuno for not being alive or having a wish or any business fighting him. This time, the words don’t hurt Hakuno. Saber has opened his eyes. Julius isn’t talking about him; those were other people, and he’s not interested in hearing about their pasts. After a trippy zero-gravity battle in which the two Dead Faces fight in midair as their surroundings rotate and reorganize around them, Hakuno delivers a decisive blow. Yet even in his dying breath, Julius assures him that he’ll end up like him eventually. Hakuno doesn’t worry about those words; he’s recommitted to being the best Master he can be for the best Servant one could ask for, who is waiting for him at the ladder to the sixth level. Rani and Rin seem poised to remain behind having accomplished their shared goal of getting a “decent Master” to the sixth level. But citing the increased difficulty at that level, Rin changes her mind and follows the pair after all, while Rani vanishes in a cloud of digital code. Thinking back on this episode, I’m astounded at how much it achieved in 25 scant minutes. It felt like a feature film, without ever feeling overstuffed, while cementing my undying love for this version of Saber, whose story was so vividly and painfully told. My head is still spinning. That was truly awesome. The fourth level was apparently so uneventful the series skips it altogether, and we end up on the very rainy and somber fifth level, which takes the form of a enormous jumbled mass of skyscrapers. 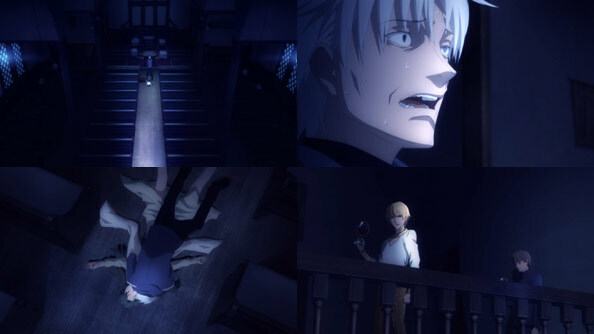 While the ladder to Level Six is in sight (and just an ordinary physical ladder) and there’s no Floor Master, there is a “homicidal maniac” lurking the floor; Julius Harwey, whom Rin remarks was defeated by Saber and her former master. All of the hope Hakuno seemed to carry with him from the third floor seems to have faded away, and the more Saber discusses her former master (who was a girl), the harder Hakuno is on himself. Saber, in another one of her warm, caring monologues, tells Hakuno not to worry about doing anything other than what he’s capable of. True genius, Saber believes, lies not in one’s talents, but by their ability to bear the cruel truth that not everyone is equal; that everyone has their roles and weaknesses. Basically, she wants Hakuno to buck up and keep doing his best. 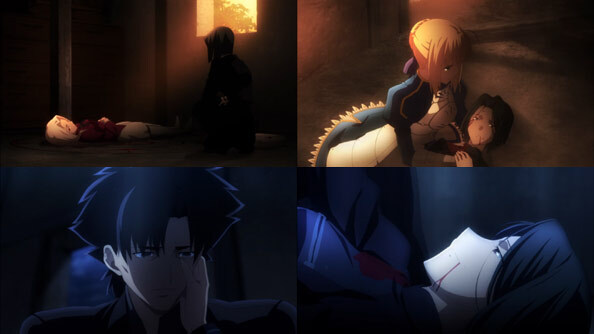 But once Julius shows up (with either a Berserker or Assassin Servant), Hakuno and Saber are quickly separated, and Saber needs an emergency save by Lancer-Rin. 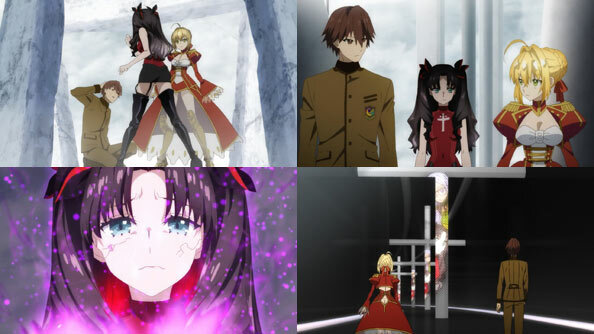 Saber leaves the Servant to Rin so she can return to Hakuno’s side. Hakuno, meanwhile, is goaded into summoning his Dead Face, but learns that Julius is also a Dead Face…”unable to save anything or save anyone,” beings whose purposes were torn away long ago. While taking what would be a fatal blow to the midsection were he actually a living human named Kishitani Hakuno, Hakuno enters a dreamlike state where he’s told exactly what he is: an amalgamation of the massive number of dead, defeated, and failed souls bearing grudges…a mass of hatred brought about by SE.RA.PH.’s long decline. He is told he ascends “only to kill”, and was born “only to die.” If Hakuno were to take these words at face value and do as Saber recommended, dying would seem to be the only thing he is capable of doing, so he should do that, no? 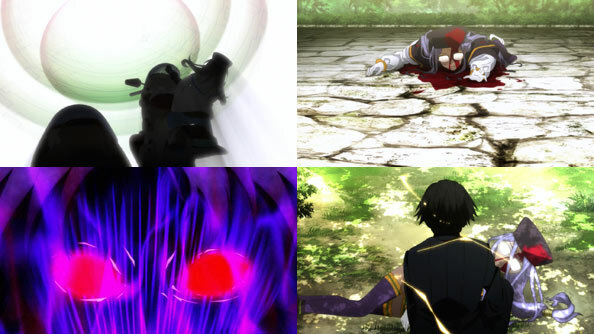 Regaining consciousness just as Saber and Rin arrive, the battle is lost almost as soon as it resumes, as Julius reveals his Servant kills with a single blow, and Saber received that blow. Hakuno crawls towards the apparently defeated Saber (Julius and the Servant only flee when a giant arm breaks up the battle that was). He’s sure that she’d have been able to win had he been a real Master…even if there aren’t any of those left. He descends into darkness, accepting everything he was told in his dream about being born from hatred. He allows himself to think for a moment that he might have been Saber’s former Master reincarnated before dismissing it as folly. But he hears Saber’s encouraging voice once more, asking if he really wants to simply give up at this point. A door appears, and Hakuno walks through it, into a classroom with projector running. Seated beside it is a girl wearing the same uniform as him, who asks him (in Ishikawa Yui’s voice) to take a seat…because “it’s starting.” Very intriguing. 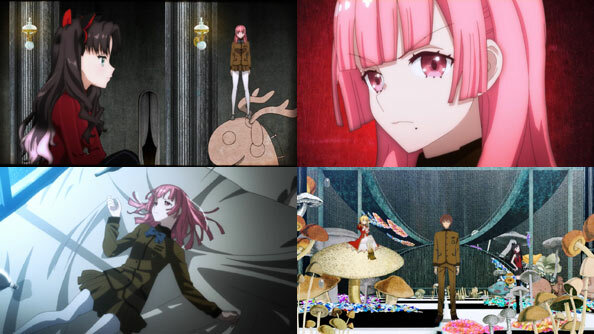 The fourth level’s part two starts with a flashback—I think—to an Alice wondering where Hakuno went, and in the process of absorbing various objects around her to replenish resources, transforms into a grotesque monster that forces the Masters to flee to lower floors, and killing and eating those that don’t. None of this seems to be anything Alice the Master intended. Back in the “present”—whatever that even is—Hakuno, Saber, and Rin make their way back to the castle. The phenomenon that sent them back was only a “respawn”, not a time loop; and all parties involved retain their memories of the first attempt. Rin (flashing an epic Shaft head-tilt) continues to drop hints to Hakuno about Dead Face without coming right out and saying that’s what he is, DFs being humans “rebooted by their grudges”, and Hakuno not knowing what beyond hatred propels him upward. When Hakuno starts daydreaming of hanging out with Alice, reading to her and playing tag, Amari is also there in some form. 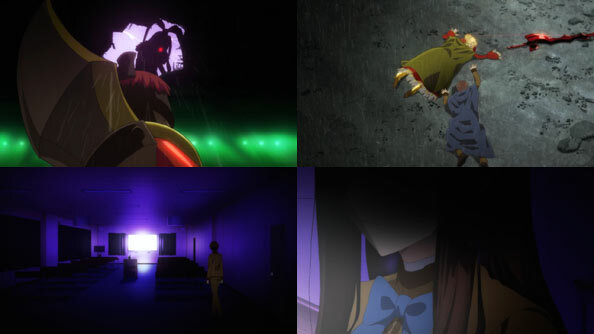 When he comes back to reality, he, Saber and Rin face the monster they’re assuming is the Floor Master’s Servant. 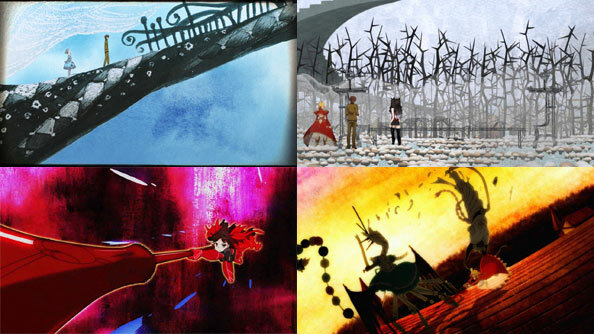 Rin puts up a barrier, but the monster sends a hail of scissors at it, shattering it and her. Hakuno manages to spend another command seal, but before the monster is destroyed and the “game” reset, he ends up back in the dream. There, Hakuno meets Alice in her true form, covered in bandages, lying in a bed, hooked up to all manner of IVs…and dead. The living, walking, talking Alice Hakuno has been interacting with is no more than a dream that dead Alice is watching, and is herself dreaming in Alice’s place, even able to take Amari’s form. Back at the starting point, after Hakuno washes up and Rin apparently had a bath, they set out once more with Saber, for what Rin hopes will be the third and final time. 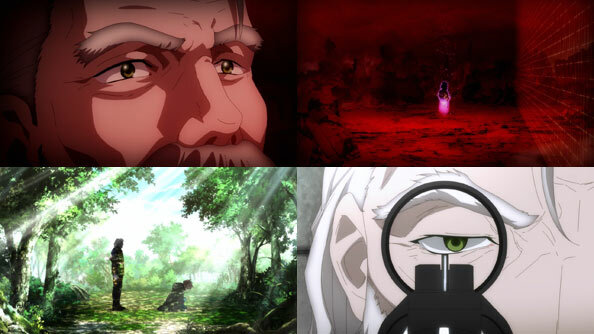 As they walk through the forest, Hakuno ponders what and where he is: a man with no past and a place where the past has piled up to the point of near-madness. Saber’s point, I believe, is that there are no guarantees. If you get to Angelica Cage, you have to beat Twice. If you beat Twice, Moon Cell has to decide to grant your wish. She wants to know if Hakuno will still ascend despite all that uncertainty. In the dream (and a repeat of last week’s cold open), Hakuno has already won the third round, as Alice conceded the fight by not showing up. 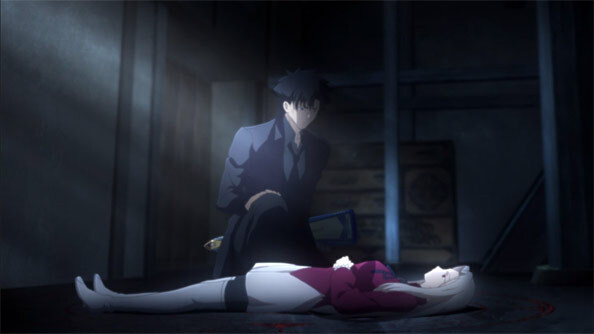 He leaves her with the promise he’ll be back once he’s won the Grail. And it certainly seems to be the case that he did return even after failing to win it. Once back with Saber and Rin, Hakuno acknowledges that he’s no one special; just a fake who made it this far in someone else’s place. But even as a fake, he wants his feelings to be true. His time with Alice in his dreams have spurred him to want to ascend not just with hatred, but with hope. 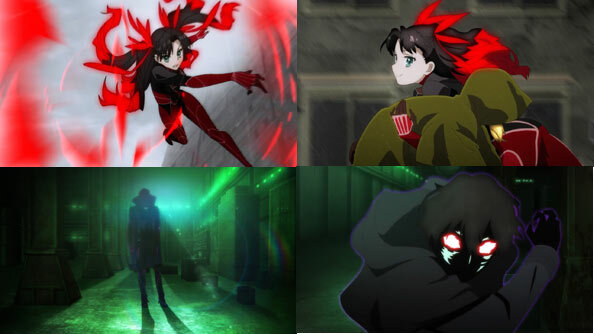 In the present, however, the Servant still needs to be dealt with, and between Rin seemingly unleashing her trump card—transforming into Lancer, complete with Gae Bolg—and Saber’s coup-de-grace, it feels as much like putting a wretched creature (or ghost, as it were) out of its misery as defeating the floor boss. 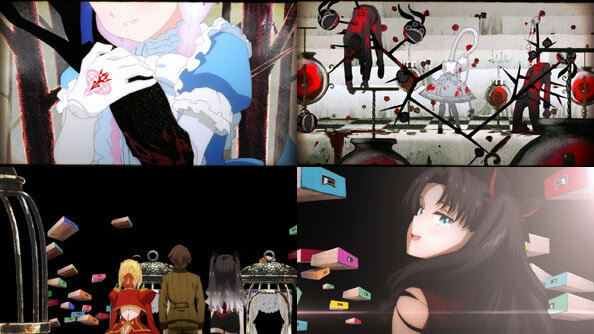 It also carries on the Monogatari tradition of lots of discussion punctuated by short, intense bursts of decisive action. On to the fifth level. The third level, the “Nameless Forest” is a totally different animal than the ones that came before, both in design and purpose. 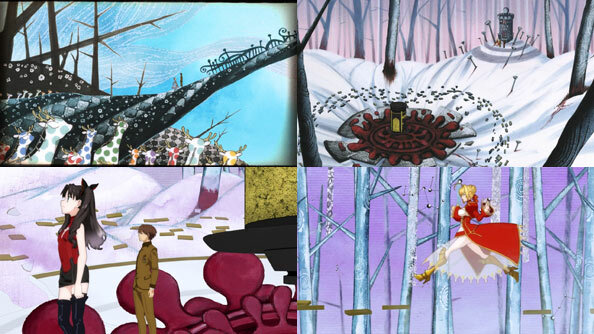 First of all, it’s way trippier, as Shinbo creates a lush and textured wonderland inspired by the aesthetic of the illusory worlds witches created in Madoka. These bizarre, whimsical surroundings make for a great backdrop as Hakuno, Saber and Rin attempt to find the Floor Master. According to Rin, the third level is the land of dreams where “ghosts” gather, ghosts being souls transferred into information by Moon Cell. 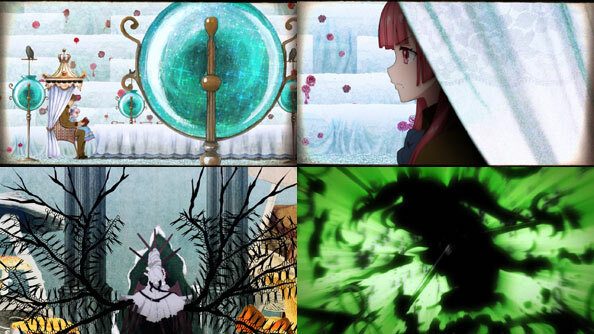 Rin also kinda answers my question from last week, in that Death Face is “something different” from the other ghosts,embodying a “different concept of death.” She also calls it a thousand-year-old legend, apparently unaware that Hakuno is that legend (or feigning ignorance for some reason). 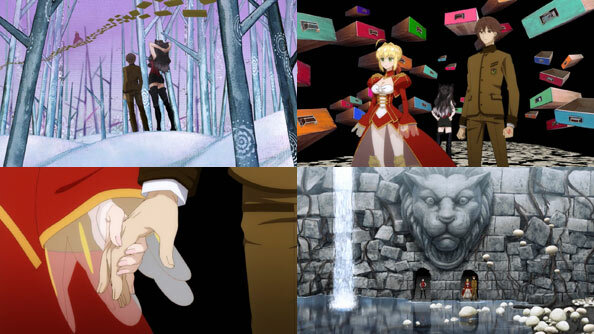 Things get increasingly weird in terms of time and space, with Saber almost instinctively taking Hakuno’s hand to ensure they won’t become separated. Even so, with all off the multi-colored drawers, tanks containing thousands of playing cards, and most concerning, a preponderance of mushrooms, Hakuno eventually finds himself somewhere other than Saber’s side. That place is in the presence of the Floor Master whom Hakuno says goodbye to in the episode’s cold open; we see his victory and ascent to the fourth level so we know it happens (or happened in the past); it’s a question of how. This Master is a ghost named Alice, and this wonderland is where she’s been ever since a war that killed everyone else, and after her life of illness was ended by excruciating pain caused by adults in a hospital. Alice wants nothing more than to have someone like Hakuno to play with forever and ever. Quite suddenly, Hakuno “snaps out of it” and is once again in Saber and Rin’s presence. A vision. If ghosts are reproductions of people’s states at the moment of death, Amari’s regrets come through strong and clear; both her insufficient strength (which Rin can sense) and when she tried to seek the week to defeat her enemies, only to find there was no one weaker than her. 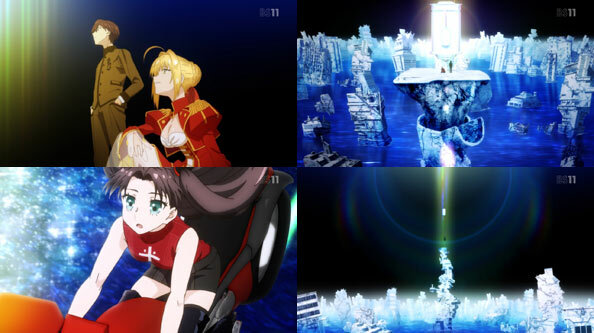 Having returned from their visions, Hakuno and Rin find signs of a battle, and Saber goes after a shambling, scissors-shooting construction of various objects as if it were like any other opponent. She manages to slash it in two, but the moment she does she and the other two are instantly transported all the way back to where they started, next to the ladder that brought them there. Even time has seemingly reverted. Rin surmises this is the work of the Noble Phantasm known as “Nursery Rhyme”, which is being used to ensure they keep repeating the same day forever. With such a power, in such a place, being wielded with such a character as the Alice we met, it’s pretty obvious we’re dealing with Caster. Swords and bullets aren’t going to do the trick this time. Last week Rani painted a morose picture: there are only a few thousand humans still alive on Earth, a dire scenario the species hasn’t seen since the last ice age. Combined with the dreadful state of SE.RA.PH, mankind is staring at the edge of oblivion. It’s a much bigger crisis than I had comprehended at the time (due partially to spotty translation); almost too big a crisis for our MC, who still isn’t sure how many times he’s died and been brought back (though it’s been a lot). All I know is, he may be humanity’s last hope. It certainly isn’t Dan Blackmore, a knight who fought and was defeated by Hakuno 999 years ago. He lost not due to lack of willpower or clarity of duty, but simply because he had more regrets and thus less resolve, than his opponent. But now that Dan’s back, he’s not going to let anything get in the way of his winning—in lieu of the Holy Grail or ascending, continued victories are their own reward, and has been for nearly a millennium. 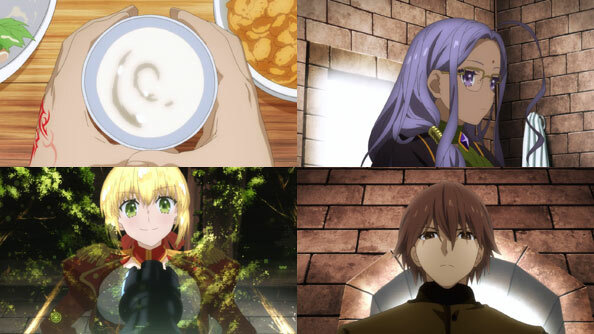 Once Hakuno is over the initial shock of learning what year it really is and how long things have been left to rot, he, Saber and Rani talk Dan, Archer, and strategy. First, since he was already defeated and died, Dan is no longer a true Master (why Hakuno, who has also died a lot, is a true Master is a head-scratcher for your humble author). As for his servant, Archer’s true name is Robin Hood, an expert in guerrilla warfare, who has two noble phantasms but cannot use both simultaneously. One allows him to attack undetected; the other, Yew Bow, is more of a coup-de-grace, and is only effective after the first phantasm has been used to shoot the target with a poison arrow. The Yew Bow detonates the poison in the target’s blood, killing them from the inside out. For the battle, Saber takes on Robin by herself, dodging a number of invisible arrows until one finally gets her, thus exposing her to the poison Robin will use to blow her up. But her part of the plan is simply to keep Robin busy, partly by asking why he still serves a man who is no longer a Master, to which his reply is both concise and logical: Would you tell a knight who’s been brought back to life and fought 999 years to simply give it up? Meanwhile Hakuno learns more from Rani (in her awesome futuristic motorcycle and sidecar) about Moon Cell’s quandary: while it can manage the “exterior” of humans, it could not understand their “core”—their reactions and emotions—even when it invited them to SE.RA.PH. for observation. So it simply discards those emotions to the bottom floor. By that same token, there is no physical or observable “world of the dead” on Earth, but SE.RA.PH. made it quantifiable, such that the hatred (and presumably other emotions) of the dead still roam around as “ghosts,” which is exactly what happened to Dan Blackmore. One could also say he respawned. Hakuno and Rani’s chat is cut short by their arrival at the clock tower, but as soon as they emerge from the forest, Rani is shot and she and Hakuno knocked off the bike. Hakuno finds cover, but Rani is out in the open, obviously bate to take. Many “ghosts” start to surround Rani, urging Hakuno to forget about her and continue up the tower to defeat Blackmore, but he rejects their certainty and chooses to save her instead, donning the Death Face to gain exceptional speed that avoids the gunshots. Rani is unable to move, but still able to fight. Deeper in the forest, Robin deems the time is right to use Yew Bow on Saber, only to have it fail spectacularly. Saber, you see, picked up on the fact the detonator targets the impurities—the poison—in the target’s blood. Her answer to that is to simply bleed out, and once Robin detonates it, divert the blood-blast with her sword. It works like a charm, and Robin isn’t ready when she charges him and runs him through. How can she survive bleeding out? Well, aside from being Saber and thus very tough, she apparently has up to three extra lives provided her body remains intact. Losing her blood now and again isn’t that big a deal…especially if it helps secure a path to victory for her Master. That leaves Dan on his own against Hakuno, who does not fall for the trap of Dan being at the top of the clock tower just because the bells ring every time he takes a shot. Dan is in fact in the tower of the citadel, firing at the bells, while the clock tower is lined with explosives. No matter; once atop the clock tower, Hakuno, in Death Face mode, shoots Dan before he can shoot him, and Dan dies with a distinct sense of relief he can finally be with his wife again. Upon his death, the elevator appears immediately, leaving Hakuno no time to get Rani. But as Saber says, Rani never intended to ascend at all. She was always content to tend to the dead and watch one last “star” ascend, which Hakuno and Saber do thanks to her assistance. 50 years of “rebellion” against Blackmore were enough. Oh, and Rin’s still hanging out on the elevator as they start their ascent to the third stratum—though Hakuno and Saber aren’t sure why. As they ascend to the next level, Hakuno ponders Rider’s dying question to him: Why does he want to ascend? All he can come up with is hatred, and a desire to simply ascent, but Saber, once again demonstrating her lack of modesty, does not consider his motivations relevant; he’ll surely find what he desires as they continue to “climb the ladder”, so to speak; she’ll help. When they arrive, the setting is a lot simpler than the complex, futuristic city: a vast forest with mountains on the horizon, and a few buildings in a clearing. In one of those buildings, someone has been waiting for them; a aging Master who also desires to ascend—and believes defeating another Master will do the trick. To that end, he fires shots with his sniper rifle from his perch in the clock tower, and Saber and Hakuno have to flee into the forest. 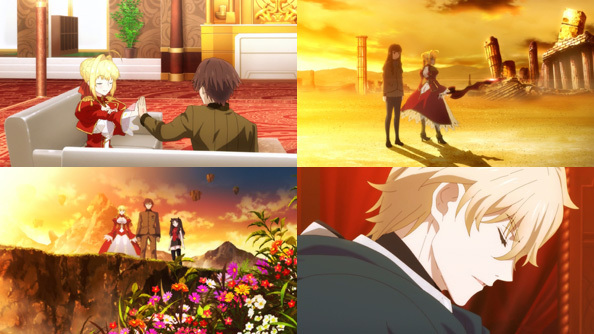 There, Hakuno makes sure to thank Saber for keeping him alive to that point, and Saber tells him to essentially not forget to stop and smell the roses—to enjoy what is beautiful, whether it’s the forest, some flowers, or her own purty face. 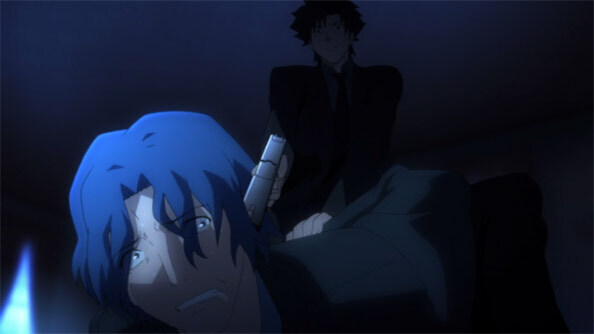 That face is threatened once more, not by the Master, but by his Servant, Archer, who drops a poison cloud on Saber and Hakuno and stays invisible, shooting invisible arrows, one of which pierces Saber’s shoulder. 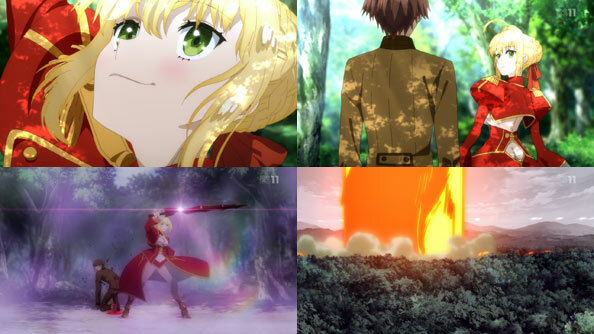 Hakuno must expend a command seal so Saber can raze all of the forest around them with fire (she IS Nero after all, isn’t she), but that’s just what Archer wants: a clear shot. 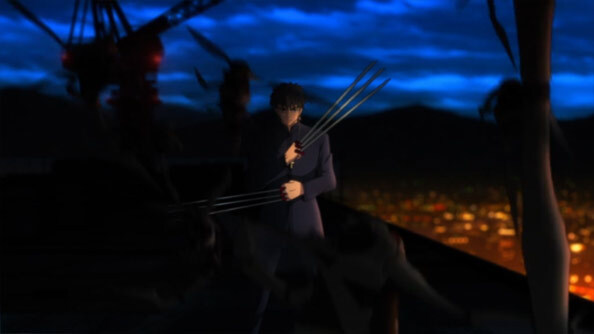 Archer’s arrows don’t find their target, however, because they’re destroyed by a surprise ally to Saber and Hakuno, the Servant-less Master Rani VIII. She takes them to her home, where she explains she is the last “rebel” Master fighting against the sniper, and has been waiting for someone like Hakuno to come along, with a Servant, to arrive on this level. She concedes that for all of its inherent stagnation, SERAPH may well be an “ideal heaven”, but that’s irrelevant, because it’s on the brink of destruction. 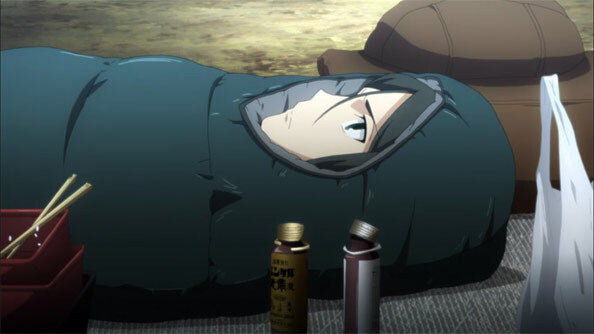 When Hakuno sleeps, he dreams of the man in the white coat he met lower down, making him to wonder if he’s trying to ascend to a place he had already descended from. After all, not only does his thus-far-inexplicable drive to ascend simply “feels like the right thing to do”, but he’s completely clueless about the actual year; he thinks it’s still the 21st Century, but Rani informs him it’s actually 3020. Worse, the humans living in SERAPH will soon be all that’s left of their race; if SERAPH goes, humans go extinct. It would seem Rani has far grander designs for Hakuno than he himself could ever have envisioned—that will determine not just the course of humanity, but its very existence in the universe. Perhaps, then, Hakuno finally has a reason to ascend…other than hatred. 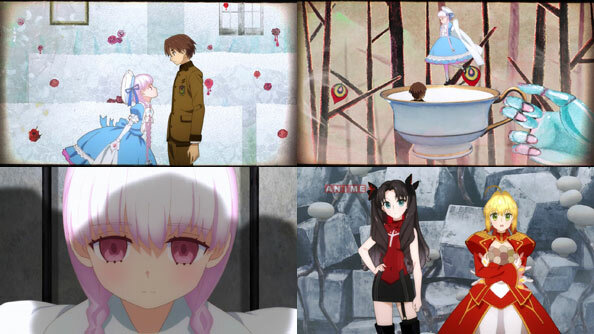 I was a little confused about what happened to Rin after seeing her in the bath with Saber. It seemed a bit convenient they’d be shorthanded when Archer attacked them. I guess she had other matters to attend to this week? 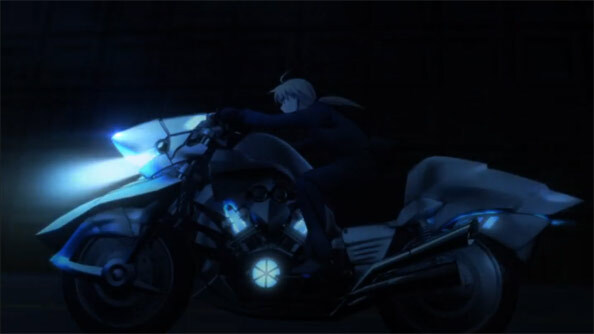 Shinji’s attempt to destroy Hakuno and Saber fails when Toosaka Rin shows up, hacks Shinji’s systems, and lends Hakuno and Saber a ride out of the tower on her flying motorcycle—all good stuff. We don’t learn anything more about Hakuno’s “Dead Face”, only that it drew Rin to their location. 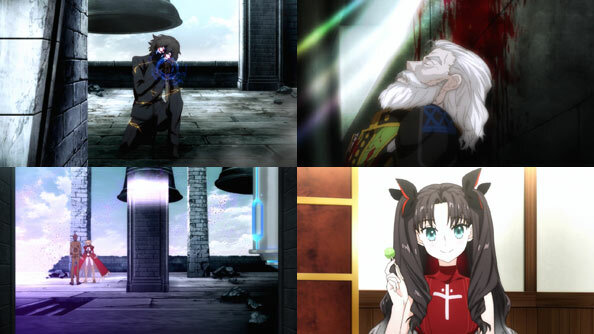 Rin takes them to a run-down but still very stylish safe house, and explains why she interceded on their behalf: while she is only a former Master, she is the only one in the city (other than Hakuno) to have not fully surrendered to the stagnation of Mayor Matou’s grand plan. She’s a resistance of one, and now that Hakuno, a fully-active Master, and his Servant Saber have appeared, that resistance grows to three. The only means of reaching the upper level is to defeat the “king” of the one they’re on: Shinji—who also happens to be an active Master. Hakuno and Saber met his Servant in the bar. The morning of their assault on Central Tower, Hakuno glimpses Saber resplendent on the rooftop’s morning light, surrounded by birds. This show is nothing if not pretty and sometimes drop-dead gorgeous in its staging of people and places. 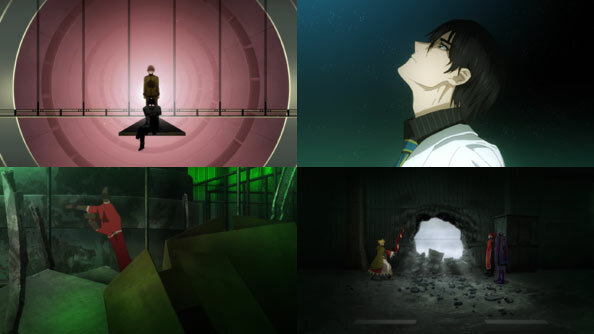 Rin assists in Hakuno and Saber’s infiltration of the tower, which necessitates her remaining behind to fight Shinji’s Berserkers, leaving the other two free to ride the elevators to the non-projection Shinji’s location. Once they reach that location—which appears in the form of a standard Japanese school rooftop, Shinji recalls the victory that got him to where he is today. In light of that victory, he is game for a duel against Hakuno and Saber. With that, massive walls begin to rise above the cityscape, great hatches open, and the entire level is quickly flooded with water, turning the city into an ocean. I love how intricately rendered this city has been the last two episodes, only for the show to completely destroy it here. The reason for the transformation is that Shinji’s Servant Rider has a naval theme: she is Francis(ca?) 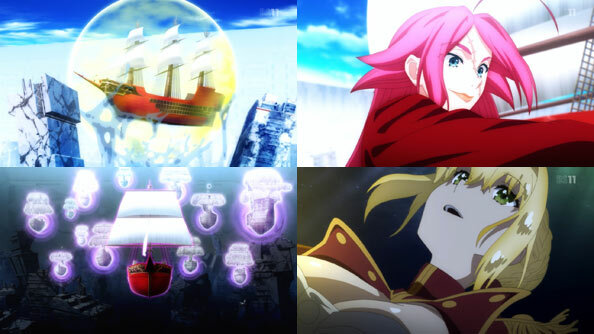 Drake, and leads an armada of flying sailing ships to face Saber and her…saber. Rider’s Noble Phantasm is the “Golden Wild Hunt” / Temesoro el Draque, and Saber is seemingly overwhelmed and sinks into the deluge, too low on mana to mount a counterattack. That is, until Hakuno dives to her location on the “sea floor” and transfer his plentiful stores of mana through a kiss, which I don’t believe I’ve seen before in a Fate series. 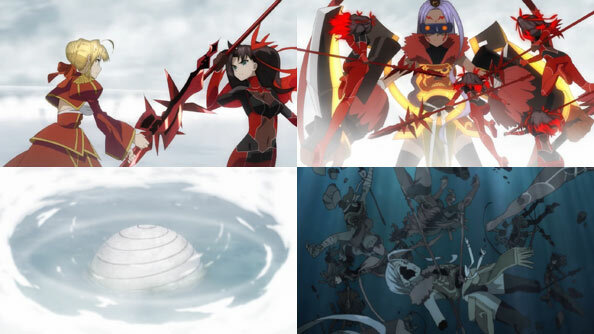 It works a treat, and Saber rises out of the water and rams Rider’s flagship with a ship of her own, revealing her Noble Phantasm one of her skills is “Imperial Privilege”, which enables her to copy her opponent’s ability. 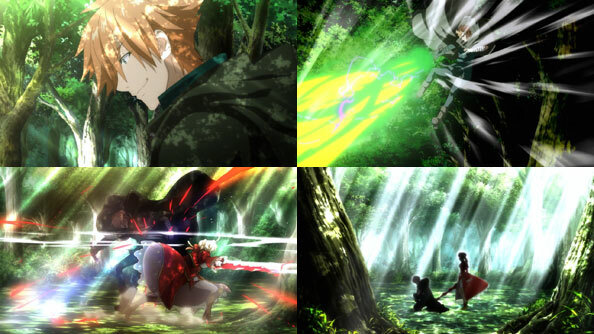 Rider and Saber face off in a decisive dual, but Rider’s flintlocks appear to jam at a crucial moment, while Saber’s sword does not miss Rider. Shinji gets to have an uncharacteristically noble end when he decides to ascend with his Servant rather than break his contract at the last moment to continue living. And that’s pretty much Mission Accomplished for Hakuno and Saber. With Shinji gone, the level is restored to its true state: that of a vast, eerie, deserted ruin. That majestic city was only ever an illusion in which cowards could stagnate for all time. While that state wasn’t ideal, there is still a measure of sadness in what was lost…even if I won’t miss Shinji, as usual. With that, a lift descends for Hakuno and Saber, which will bear them to the next level up. Rin, who obviously did not drown in the deluge, trails right behind them on her flying motorcycle. What visual wonders, challenges, Masters and Servants await them on the second level? I can’t wait to find out.